When? August 2013. The BIG Trip. Coming from Samoa. Next stop – Fiji. There is quite a long layover at Nadi airport in Fiji. I try to sleep on the benches provided, but three guys with a banjo are providing a rousing welcome for all the tourists. Even when they stop every time I nod off I am woken by the ping of another extraneous announcement. The plane to Tonga is a little late taking off, as the staff have found a ukulele in the departure lounge and want to track down its owner. I wonder if it is a camouflaged explosive device. When I get to Nuku Alofa in Tonga the fun really begins. I have been emailing a lady named Nive at my hotel to arrange airport pick ups and tours, as I only have two and a half days here and tomorrow is Sunday (the Tongans are even more religious than the Samoans). No sign saying Susan Rogers at the airport. In fact no-one to meet me at all. So I take a taxi into town and am dropped off at a building site. It does have the right name over the door, but I make the little driver wait while I check I’m in the right place. Yes, up the stairs at the back is a semblance of a once grand hotel, but it’s shrouded in dust sheets. I’m told this is all fine as work doesn’t actually start till Monday. Yes, the restaurant downstairs will be open later. I’m surprised. All I can see are bulldozers and cement mixers. Nive has forgotten to tell anyone to pick me up. No-one knows anything about my tours. And she’s not here; it’s her day off. She’s not answering her phone either. Nive is tracked down and she will be here in ten minutes. No, she won’t ,she will be here in an hour, she is taking her auntie to the airport. At least her auntie hasn’t been forgotten. Three hours later she still hasn’t come. I’m a little upset. The receptionist calls the manager who is a pleasant young man who is clearly terrified of what I might write on trip advisor. I’ve been give wine (which I returned), been promised free meals and trips (the manager says he will sort them all out) and I’m now in a different (sister) hotel on the waterfront. Instead of attempting grandiose lofty opulence this one is colonial verandah style. Both are an odd mix of traditional wooden furniture and plastic. There is a blue soap container with a doll painted on it. Time for some sleep! But, no, here is Nive at the door insisting that she has to talk to me. She won’t be dissuaded. She is melodramatic and remorseful. She wants to take me out tomorrow. Don’t use the agent tours they are rubbish. But please don’t tell the boss she’s doing it instead. How am I supposed to manage that? O good, now I’m in the middle of a ‘situation’. All I want is some sleep. The room is noisy, so I turn off the air conditioning, but I can still hear a buzzing noise. Ah, I track it down – it’s my suitcase. My new electric toothbrush has gone berserk. In the end an absolutely fascinating day touring with Nive in the hotel’s pick-up. Cook dubbed Tonga The Friendly Islands, for obvious reasons, though I think they still practised cannibalism at that point. This island, Tongatapu, is the largest of about 170, total population 100,000. It is very flat and very slow. Even the taxis crawl along. And I do hope there isn’t a tsunami, as there is absolutely nowhere to run to. It reminds me of Efate in Vanuatu, lots of coconut plantations, farms and churches with coloured perspex windows. 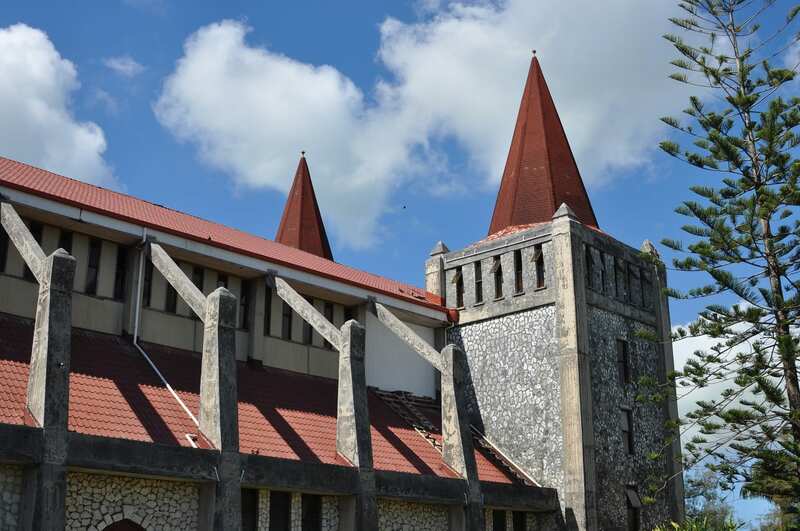 There is even a cathedral with concrete flying buttresses. The Mormons are very influential here and are aspiring to make Tonga the first Mormon nation.They already have a church in every village and several schools and they own all the cattle. The Mormon men are the only ones who wear trousers. ( A book of Mormon is supplied in my bedroom alongside the Gideon bible). It’s also incredibly quiet, other than the singing. No-one is allowed to work, play sport or even fly on a Sunday. The mainland is roughly the shape of a broken heart with the huge lagoon intruding into the centre. There are only a few beaches here, but there are motu beckoning invitingly across the water. It’s not as chocolate box as Samoa, but still very colourful and cared for. It also has its unique attractions. First, I observe flying foxes hanging in casuarina trees. They really do have little fox like gingery heads. The locals eat them, of course. (They also quite enjoy the odd meal of dog I’m told. ) If a white bat appears its a bad omen for the royal family. Someone will probably die. 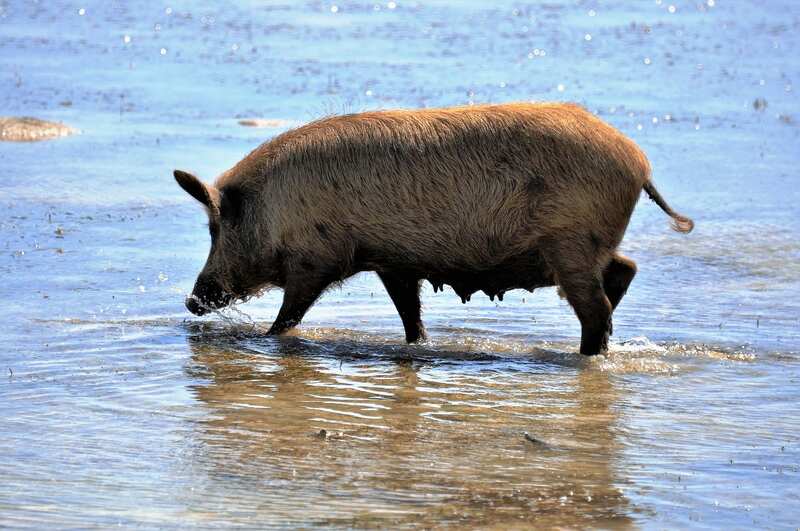 Next, fishing pigs- pigs that forage on the reef for small fish and sea creatures, when the tide goes out. Their chomping is so loud I suspect that they are eating the coral too, so that won’t do it a lot of good. 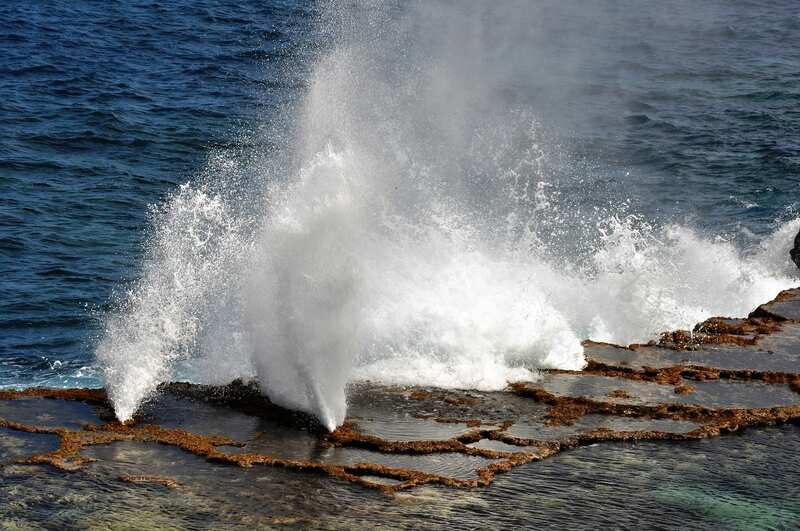 Then, on to the most amazing piece of rugged coastline with hundreds of blowholes. I’m in luck, today, everything is going as well as it went badly yesterday. The waves are just right and there is a spectacular foaming show, with white jets shooting up into the sky against a paint palette of churning blues. There is also a coral bridge showcasing another bit of ocean and a cave with stalactites and a freshwater pool where I am invited to swim. I decline. I can’t see the pool or what’s in it very clearly at all and the lights have already gone out once. More follows: a 1200 coral ‘Stonehenge style’ gateway, some tombs of the same period, some royal palaces, another Polynesian banquet. This time the food is served on cross sections of banana plant stalks. It’s mainly very tasty and follows the usual themes with some variations like octopus and yam. ( Surprisingly, yam is expensive and is considered a delicacy). I’m not too keen on the corned beef with coconut in taro leaves. The people are poor, but seem content. Everywhere is quiet – I’ve met about eight tourists all day. And the best is yet to come. We visit a church. The singing is melodious and uplifting and everyone is dressed in their finest. 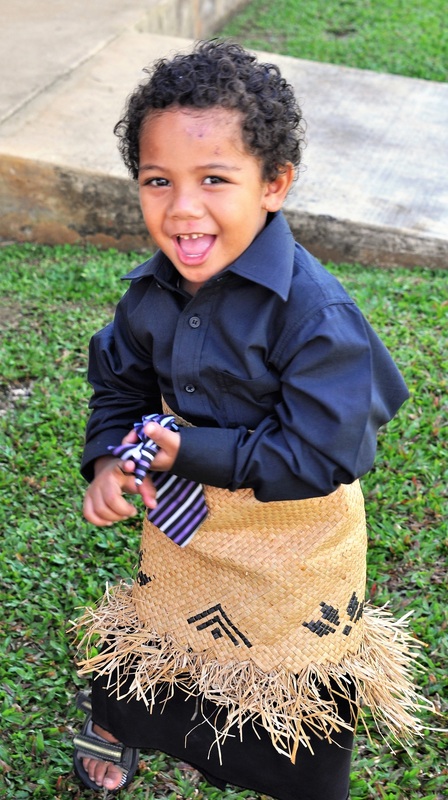 Depending on the denomination of the church, dress is either hats (for ladies) or woven pandanus mats (for all), which they wrap round their waists. If there has been a funeral recently they wear black and the size of the mat equates to the relative superiority of the deceased. Some folk are virtually swamped. It seems common for younger women to substitute woven dangling belts and some more elderly matriarchs have eschewed mats and instead espoused white dresses with red scarves. This might be the choir. Though there seem to be several choirs who perform at different times. There is an abundance of gold teeth glittering as they sing. Nive tells me to wander round and take photos, but I am a tad reluctant – it seems awfully intrusive. But to my delight (and relief) I am beckoned in and all the old ladies compete to pose for pictures, signalling to me and looking offended if I don’t select them. It’s a brilliant spectacle. Meanwhile, the service continues. Back at the hotel I now have a suite. There is a huge bath with jacuzzi spouts that don’t work and an enormous shower that I have to walk through to climb into the bath. There is even another bed on a mezzanine floor. I might sleep in that one tomorrow. I had wanted to visit the northern islands, as they are supposed to be gorgeous and feature swimming with whales. I simply couldn’t fit it into the itinerary. It’s just as well. Some Kiwis tell me that their government advises tourists not to use the only domestic airline here. And there was a big disaster a few years ago when the ferry sank. I’m waiting to go to a motu instead. I’m sitting looking at the replacement ferry now and I’m not reassured that it’s any better; my boat is running late, the captain’s gone shopping. When we do leave I scramble onto the roof of the boat with everyone else. It’s a good view and I’m glad that the sea is calm. My motu is a delightful little treasure island style retreat. We disembark onto a pontoon that comes to meet us – it has an outboard attached and it’s quite civilised her:, hammocks, sunbeds and cocktails. Back at the hotel I am the only guest tonight. The chef has come in specially to cook for me, so I can’t possibly tell him I’m still full of Polynesian feasts. It’s a public holiday as its the king’s birthday. ( The locals tell me he’s a good king, though some of them struggle to recall his name. I believe it’s King George V Tupoea.) It’s as quiet as it was on Sunday. Every thing is closed. The timing of my three days in Tonga hasn’t been very helpful. The country simply isn’t geared up for tourists and you clearly need to be well prepared and take things slowly. It’s another beautiful day. There are a few families out on the reef building enclosures to trap fish or ambling along, foraging with the pigs. They are all fully clothed, even in the water. It’s illegal to take your shirt off in a public place. I’m preparing to go back to Fiji. Nive still hasn’t shown up. She was supposed to take me to the boat yesterday. She was going to arrange a hairdressing appointment for today. Nothing. The guy who was going to take me to the airport is late. But the manager is picking up my whole bill, food, drink, transfer. The lot. So that’s all right. To see more of my photos of Tonga, visit this page. 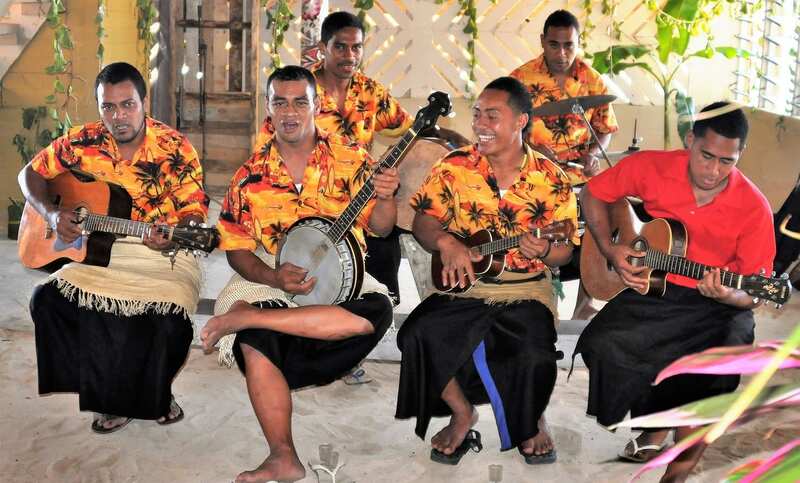 Tonga is said to have the highest proportion of Mormons of any country in the world. Obesity is thought to represent health, wealth and happiness. Ninety per cent of the population of Tonga are overweight; 70 per cent of adult women are obese.